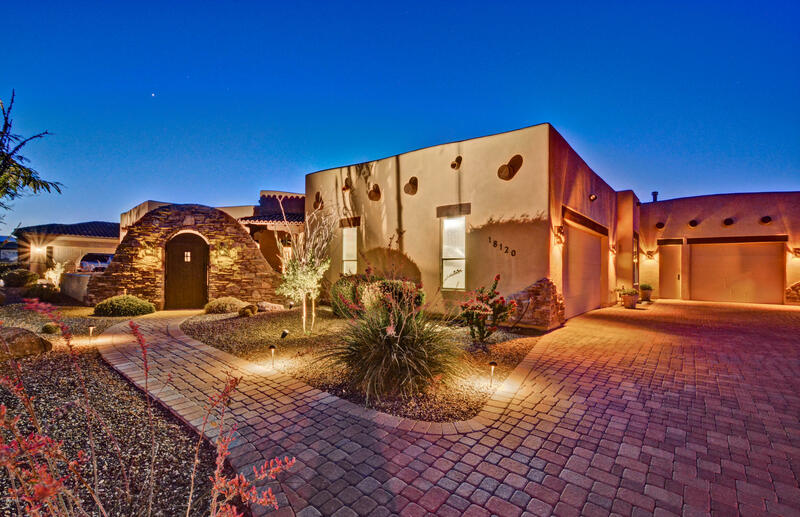 Gorgeous custom built home located in the gated community of Russel Ranch. Walk thru a rustic arched stone entry into a tranquil paved courtyard with exquisite water feature. Split floor plan includes 3994 sqft, high ceilings, exposed wood beams, built ins, den and exercise room. Open kitchen w/ chiseled granite counters, island, huge buffet, gas range, and spacious pantry. Get cozy in the Master En Suite w/ the stone fireplace and gorgeous built ins. BRs 2 and 3 include, custom built ins, private bathroom with tiled showers and walk in closets. Bedroom 4 is perfect for exercise or craft room. Step out to a backyard oasis with a Pebble Tec pool and spa w/ 3 cascading water falls and a baja step. This backyard was built for entertaining with the pro grade misting system, huge Palapa, outdoor kitchen and firepit. The 3rd car garage has been extended to fit a boat! It also features 2 doors, one in front and one in back making access to yard equipment and tools effortless. This home sits on nearly a half acre and has been meticulously maintained. It is a MUST SEE!! Come fall in love with this beauty. © 2019 Arizona Regional Multiple Listing Service, Inc. All rights reserved. All information should be verified by the recipient and none is guaranteed as accurate by ARMLS. Information deemed to be reliable but not guaranteed. Real estate listings held by brokerage firms other than West USA Realty are marked with the ARMLS logo and detailed information about them includes the name of the listing brokers. Listing broker has attempted to offer accurate data, but buyers are advised to confirm all items. Only IDX residential listings are displayed on this site. The information being provided is for consumers' personal, non-commercial use and may not be used for any purpose other than to identify perspective properties consumers may be interested in. This site will be monitored for 'scraping' and any use of search facilities of data on the site other than by potential buyers/sellers is prohibited. Information last updated on 2019-04-20.